Britannica School is a citable, online learning resource trusted by teachers and pupils. The information in Britannica School is aligned to the national curriculum, updated daily and spans a range of media, including video, images and audio content. Curated and checked by professional editors, it is the must-have learning and teaching digital resource. With the ability to browse by subject, look for biographies, explore the World Atlas, compare statistical information between different countries and discover interactive resources, Britannica School makes digital learning more accessible than ever. The breadth of resources available means that whether a school has a diverse catchment, mixed-ability classes or encourages project-based learning, teachers can easily cater for different needs. 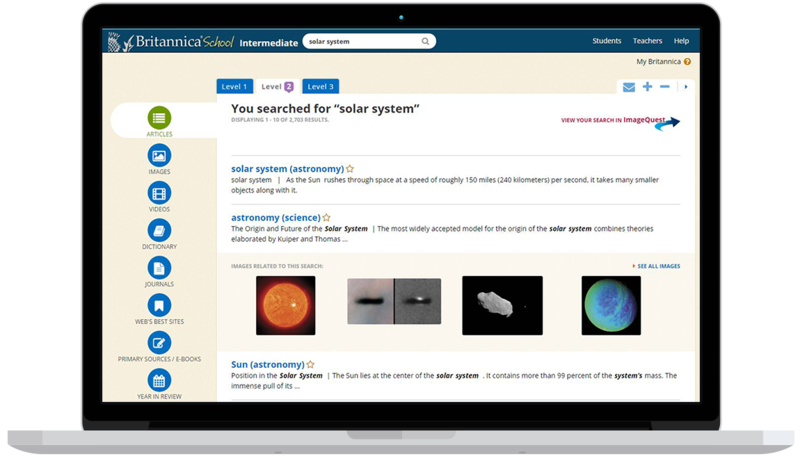 Britannica® Spotlights, part of Britannica School, is a series of mini websites that focus on key dates or curriculum-specific topics. The websites bundle together relevant articles, learning resources and lesson plans to help teachers deliver effective and engaging lessons. With the flexibility to use the resources online or offline, Teachers can embed videos or print images with the click of a button. Whatever age the child, Britannica School encourages inquisitive minds in a safe online environment. We have created engaging features, such as quizzes, that encourage confidence in discovery and resources that make learning fun for younger children. For older students there is more challenging content and “how to” guides that help students prepare large projects and presentations confident in the knowledge that they are using accurate, fact-checked information. With anytime, anywhere access to Britannica School, students are able to access safe online resources to complete homework and develop their research skills using trustworthy, citable information. Britannica School also has tools that enable parents to support their child’s learning, so teachers, parents and children can all work in partnership using the same resources. Britannica stood out and impressed us because of the proven quality and reliability of the articles. It has saved our teachers a lot of time in vetting online material to ensure that it is appropriate for our students. How can I download more information? How does Britannica School relate to my curriculum? How does Britannica School support pupils/parents for whom English is an additional language? Who has access to Britannica School? How can we integrate Britannica School? Can I copy or reuse content in my own work? How can I download more information? Click the button below to download the full brochure. How does Britannica School relate to my curriculum? Britannica School is a cross-curricular resource that supports learning across all subject areas. Britannica School is excellent for differentiated learning and is aimed at raising academic achievement. The resource also helps to promote literacy across the curriculum and content pieces can be used both inside the classroom and for homework tasks or research reports. How does Britannica School support pupils/parents for whom English is an additional language? Britannica School takes advantage of the translation facilities provided by Google. Integration of the translate feature allows us to translate articles into all languages that the Google-translate tool supports. Each article also contains read-aloud functionality as well as an on-demand dictionary. Britannica School also provides three reading levels so each user can find the content that suits their needs and abilities. Who has access to Britannica School? A subscription includes use for all students and all teaching staff in school, from home and on any device. How can we integrate Britannica School? Access to Britannica School does not require individual login IDs or passwords. There are a range of authentication options. We work with most LMS and VLE systems and also provide access through IP authentication and URL referral. Britannica will work with your school to provide remote access, helping to promote parental engagement.